Email marketing automation is meant to start 1:1 personalized communication tailored to each individual user. It enables marketers to create fully scalable workflows and respond to completed purchases, abandoned carts, and much more. 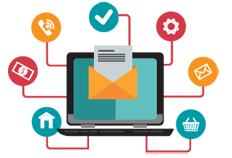 Brainpulse offers a robust set of email marketing automation solutions to increase your campaign productivity and effectiveness. With an innovative campaign builder tool, marketers can design and shoot email campaigns based on subscribers' actions, decisions, goals, delays, and exits. This is how we make sure that right communication is sent to the right people and at the right moment. Our innovative email automation platform delivers automated, one-to-one messages based on customers’ actions and preferences. Brainpulse’s marketing automation gives marketers robust control over data management, segmentation, deployment, personalization, and customer journey design. Email marketing automation is an ecosystem that helps marketers to send effective messages suited to the needs of subscribers. This is truly effective for budding marketers as it easily automates ongoing conversations with customers and ensures de-livery of personalized communication to your target audience. How Our Automation Engine Helps? Brainpulse brings to you the best email marketing automation platform ever. With matchless campaign automation capabilities on-board, you can automate your email promotions with highly personalized product offer to match individual customer pro-files. In a matter of minutes, connect with your high value contacts and generate more referral opportunities for business growth. With Brainpulse, you enjoy enterprise-level email automation without worrying complex workflows and other hassles. Below are the features that simplify the entire automation process and guarantee 100% campaign success. Find the countless things you can do to create a rock solid email mail marketing campaign. Our innovative campaign automation dashboard comes with 50+ ready-to-use, beau-tiful email templates. Design, test and send professional-looking emails without hav-ing any designing skills. Track subscriber activity on your site/in your app on the go. Measure your campaign progress with a number of key performance metrics. With advanced testing tools in-built, perform an A/B test on your campaigns and ensure if every email is optimized for your audience. Want to know more about how we can help you in email marketing automation, give us a call or drop us a mail. Our consultants will contact you with more details.